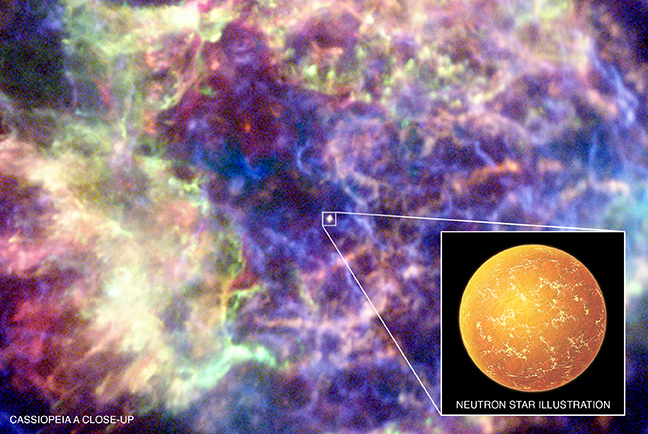 The neutron star at the center of Cas A is found to have an ultra-thin carbon atmosphere. This atmosphere is uniformly distributed across the neutron star, explaining why there are no pulsations detected from this object. The neutron star in Cas A was first detected over ten years ago in Chandra's "First Light" image. This Chandra X-ray Observatory image shows the central region of the supernova remnant Cassiopeia A (Cas A, for short) the remains of a massive star that exploded in our galaxy. 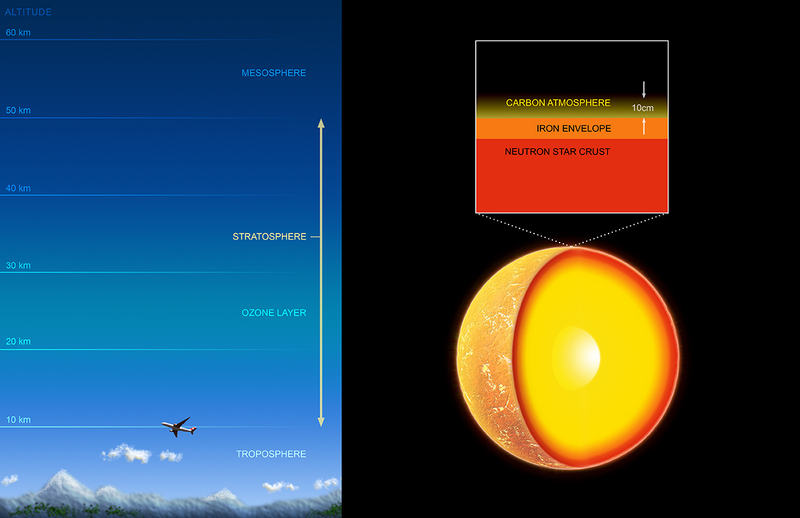 Evidence for a thin carbon atmosphere on a neutron star at the center of Cas A has been found. Besides resolving a ten-year-old mystery about the nature of this object, this result provides a vivid demonstration of the extreme nature of neutron stars. An artist's impression of the carbon-cloaked neutron star is also shown. Discovered in Chandra's "First Light" image obtained in 1999, the point-like X-ray source at the center of Cas A was presumed to be a neutron star , the typical remnant of an exploded star, but it surprisingly did not show any evidence for X-ray or radio pulsations. By applying a model of a neutron star with a carbon atmosphere to this object, it was found that the region emitting X-rays would uniformly cover a typical neutron star. This would explain the lack of X-ray pulsations because this neutron star would be unlikely to display any changes in its intensity as it rotates. The result also provides evidence against the possibility that the collapsed star contains strange quark matter. The properties of this carbon atmosphere are remarkable. It is only about four inches thick, has a density similar to diamond and a pressure more than ten times that found at the center of the Earth. As with the Earth's atmosphere, the extent of an atmosphere on a neutron star is proportional to the atmospheric temperature and inversely proportional to the surface gravity. The temperature is estimated to be almost two million degrees, much hotter than the Earth's atmosphere. However, the surface gravity on Cas A is 100 billion times stronger than on Earth, resulting in an incredibly thin atmosphere. A couple of science fiction authors have speculated about the possibility of self-replicating structures life on neutron star surfaces, Robert Forward's novel "Dragon's Egg" is the most well-known example, and I think quite well-done. Thanks for your comment. The surface of a neutron star certainly wouldn't be the first place I would consider for the possibility of life, even very exotic life. The surface gravity and temperature, the magnetic fields and the atmosphere's density and pressure are all very high. You are on the right track. In fact there is a neutron star at the core of the Sun and probably of every other star. The Sun and the cosmos are powered by neutron repulsion. I urge those at the Chandra Observatory to join the Yahoo Group, that Kirt Griffin established, to discuss the concept of neutron repulsion. Please contact him or me for details. Thank you for info on Cassiopeia absolutely fascinating and very informative. Why is everything we discover strange? Answer we don't know squat. Keep exploring, learning, there is much out there. That is most interesting. I wonder what the significance of the carbon atmosphere is? This may be too far out of a question, but we talk of the possibility of life on other planets, could there be the chance of there being a life as we do not know it living in stars or on or in their atmospheres. There was a SF short story I read long ago that speculated about this type of life. Sounds interesting, but explaining how was it established that this peculiar atmosphere is composed of carbon and that there is underneath an iron shell. And why does it prevent the pulsation - do not the shells rotate with the neutron star? At least a reference to a source or article where more details are available should be given with your reports. About 10,000 light years from Earth. This multi-colored X-ray image was made by assigning different parts of the X-ray range that Chandra observed to colors recognizable to the human eye. Red = low-energy X-rays; green = medium-energy X-rays; blue = high-energy X-rays.